Failed hip replacement surgery. 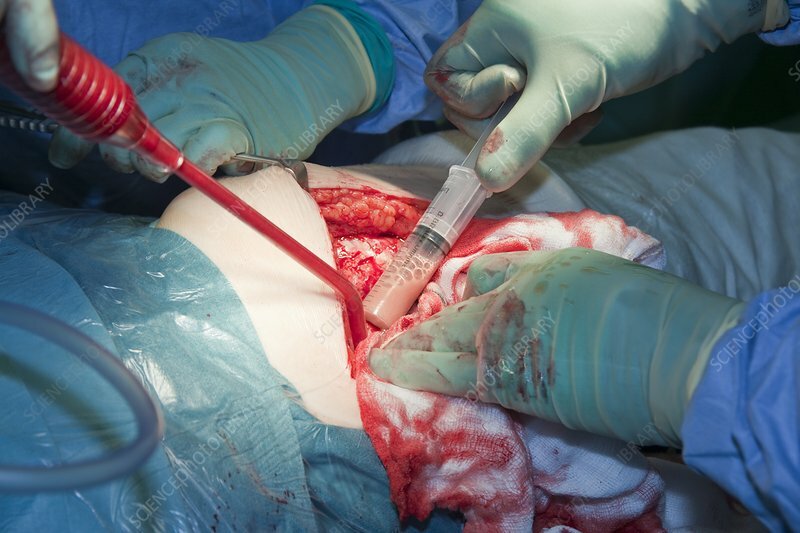 Surgeon draining tissue around a hip replacement that has displaced after less than two years. The displacement is due to the formation of an ALVAL (aseptic lymphocytic vasculitis associated lesion) cavity in the soft tissue around the hip joint. The cavity is a result of excessive wear on the replacement hip components releasing metal ions that cause inflammation and tissue destruction. ALVAL reactions are most common in females, most probably due to the smaller size of their prosthesis leading to more wear. Treatment is with removal of the metal prosthesis.